Attitudes toward nature and viewpoints on the human species' relationship with nature have evolved over the course of history. Societies have always had to deal with environmentally related problems. As populations have grown over time and human ability to organize society has grown in technological and economic complexity, the human–environment relationship has become increasingly problematic. In recent decades, economic affluence and greater access to information have fueled increasing concern for the environment . The human species has spent most of history living as hunters and gatherers. Given the species' survival needs for water, access to water was an important consideration in these activities. As hunting and gathering groups were relatively small and quite mobile, water quality issues were not a major consideration. As the agricultural transition occurred, humans settled into more permanent villages, raising crops and tending animals. Access to water for irrigation enabled this agricultural transition. Many villages grew up in areas with prime access to water. Water-related issues are important to environmental agendas. These activists, protesting outside an annual meeting of BP Amoco, opposed Amoco's proposed offshore oil drilling in the Arctic Ocean. 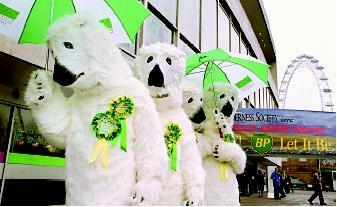 Their dress as polar bears symbolized potential impacts on the region's ecosystems. could be stored. Inventions that allowed people to transport water and effectively use water to irrigate crops played a large role in the emergence of cities. Coastal areas were often desirable locations for their transportation access. Continued efforts to transport and store water further influenced the development and growth of cities. Access to water was a prime factor in the settlement and westward expansion of the United States. The Industrial Revolution brought significant economic, technological, and social changes to the United States, especially in terms of urbanization and population growth. During the second half of the nineteenth century, the United States became a world power. The economy expanded rapidly as mass consumption dramatically increased. Much of this economic power derived from the exploitation of natural resources. Industrialization also had significant environmental impacts. Congested cities and worsening pollution made many people long for the cleaner past, and a back-to-nature movement developed. Ralph Waldo Emerson, Henry David Thoreau, George Caitlin, George Perkins Marsh, John Wesley Powell, and John Muir were some of the early voices of this growing nature movement. As the environmental impacts grew and were increasingly visible and debated, citizens gained greater awareness of their environment. Water pollution in urban areas was particularly noticeable to city dwellers. The Progressive Era (1900–1920) witnessed the rise in popularity of the idea of conservation . The conservation movement, led by Theodore Roosevelt, argued for the more responsible and efficient use of natural resources. Preservationists of the time argued for the protection of nature for its own sake. While concern for water resources was evident in these debates, the emphasis was on protecting wilderness areas. During this period the nation was still in a period of developing its water supplies, as witnessed by the 1902 Reclamation Act to fund the construction of dams and other water projects throughout seventeen western states. After Roosevelt left office, debates between conservationists and preservationists continued. These debates climaxed in the infamous battle waged by John Muir and the Sierra Club to prevent the Hetch Hetchy Valley's Tuolumne River in California from being dammed. This fight over a free-flowing river in the Yosemite National Park sparked a national debate and ultimately ended in defeat for Muir. However, his fight raised the country's awareness and broadened discussions concerning environmental values and ethics. While the foundations for the modern environmental movement were firmly planted, water-supply development remained the top priority and it continued for the next several decades. The 1920 Water Power Act, the 1927 River and Harbor Act, and the creation of the Tennessee Valley Authority during Franklin Delano Roosevelt's presidency exemplifies this emphasis on water-supply development. Some researchers say the modern "Age of Ecology" began on July 16, 1945, when the atomic bomb was first exploded in New Mexico. It is clear that widespread ecological concern grew significantly in the post–World War II era. Confidence in the benefits of technology and the infallibility of scientists declined, and the exploitation of nature was increasingly questioned. The ongoing conservation movement soon turned its attention to water issues, particularly water quality. In 1948, the Federal Water Pollution Control Act was passed and signaled the beginning interest in water pollution by the House and Senate Public Works Committee. In 1956, Congress passed the Water Pollution Control Act. Water quality issues were a prime concern of environmental groups and the general public. Preserving water-based ecosystems was also a concern with the Everglades National Park being established in 1947 and the defeat of the Echo Park dam proposal by Congress in 1956. The year of 1960 saw the passage of the U.S. Clean Water Act, 2 years prior to Rachel Carson's influential book, Silent Spring. Carson's popular bestseller promoted the public's understanding of the dangers of DDT and other pesticides in the environment, including runoff into waterways. Carson made concrete the interconnection between humans and the natural environment in modern society. Her message came at a time when U.S. affluence and leisure time were increasing. Clean water and air, open space, and health issues were among the growing concerns by Americans for environmental values. The federal Water Quality Act, passed in 1965, set specific standards for states to achieve. The Land and Water Conservation Fund set aside funds to acquire land for parks and recreation areas. Water-based recreation grew in popularity and increased citizen interest in water resource issues. Firemen spray water on the tug Arizona as a fire sweeps the docks in Cleveland, Ohio in November 1952. The fire, which started in an oil slick on the Cuyahoga River, destroyed three tugs, three buildings, and the ship repair yards. A similar fire in June 1969 received nationwide attention and brought a sharp focus on environmental quality issues. proposed by the U.S. Bureau of Land Management. This national debate signaled the end of the era of large dam-building in the United States. 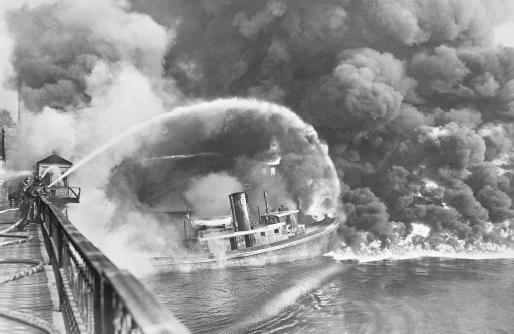 In 1969, a major oil spill off the coast of Santa Barbara, California and the Cuyahoga River in northern Ohio catching fire were dramatic water-related disasters that caught the media and public's attention. Publicity of such events, along with increased public awareness, helped lead to the passage of the National Environmental Policy Act. The year of 1970 saw the first Earth Day celebration and the creation of the U.S. Environmental Protection Agency, which eventually would contain an Office of Water and an Office of Wetlands, Oceans, and Water-sheds. Over the next few years, water resources remained in the public spotlight with the case of Tellico Dam in Tennessee and the passage of the Safe Drinking Water Act. Water has influenced the rise and fall of civilizations throughout history. Water resources continually teach societies about the interconnections to be found in the environment, and of the need for an ecology-based perspective. History reveals that people have always had a special affinity towards water. Water quantity and quality concerns are basic to society's well-being, and water-related issues continue to be vitally important to environmental movements in the United States and worldwide. SEE ALSO Carson, Rachel ; Clean Water Act ; Economic Development ; Endangered Species Act ; Environmental Protection Agency, U.S. ; Legislation, Federal Water ; National Environmental Policy Act ; Planning and Management, History of Water Resources ; Powell, John Wesley ; Recreation ; Safe Drinking Water Act ; Tennessee Valley Authority . Kline, Benjamin. First along the River: A Brief History of the Environmental Movement. San Francisco, CA: Acada Books, 1997. Quinn, Daniel. Ishmael: An Adventure of the Mind and Spirit. New York: Bantam Books,1992. Worster, Donald. Nature's Economy: The Roots of Ecology. San Francisco, CA: SierraClub Books, 1977. Kovarik, William J. Environmental History Timeline. Radford, VA: Radford University. <http://www.runet.edu/~wkovarik/hist1/timeline.new.html> . The Gallup Poll News Service conducted a 2001 Earth Day study of Americans' opinions about the environment and water resources issues. This poll found that 53 percent of Americans described the condition of the environment as "fair" or "poor" and that 42 percent worry "a great deal" about the quality of the environment. This study also found that pollution of drinking water tops Americans' list of specific environmental concerns, with 64 percent worrying a great deal about this issue. This public opinion poll also found that a large majority of Americans favor increased action to protect life on Earth.